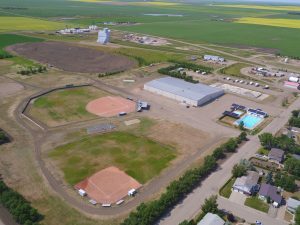 The Eston Fairgrounds contain two junior ball diamonds and one senior ball diamond. Senior ball is played throughout the spring and is on a recreational basis. Eston minor ball runs during the months of May and June each year. Registration for minor ball is now open. Please complete one registration form per participant. A $20 late fee per registration will apply if submitted after March 1, 2019. KidSport funding is available for those who qualify, but is not guaranteed. KidSport Funding must be applied for prior to ball registration deadline. All payment methods are accepted; please make cheques payable to the Town of Eston. Registration is not complete until this form, payment and ePact medical information have been received. 1) To be used for the first few weeks of the season until the fields are ready or on rain days. 2) Equipment (pitching machine, artificial mound, etc.) is to remain in the arena. 3) Coaches are responsible for supervising their team and ensuring that the equipment is respected and the arena is left clean. 4) Practice days and times are the same for indoors and outdoors. If any of the above items are being take advantage of, privileges will be revoked. Baseball Sask and Baseball Canada are excited to announce the launch of the DQ® Rally Cap Initiation Program for all active members of Baseball Sask. Rally Cap, while designed for the kids, is also a tremendous teaching tool for coaches just entering the game. A complete set of practice plans, along with drills and skill development ideas are built into this program. The DQ® Rally Cap Program is an initiative to enhance players’ and coaches’ first experience with the game. The program helps teams teach players the five FUNdamentals of baseball in a fun and safe environment. Players have the opportunity to perform different tasks in order to earn a coloured Baseball Canada DQ® Rally Cap. Cap colours correspond with various levels of achievement. The program is designed for young baseball players. 2. Develop fundamental motor skills and teach baseball skills and rules to the players. 4. Promote increased self-esteem among DQ® Rally Cap children and adults. 5. Recruit new coaches and volunteers.